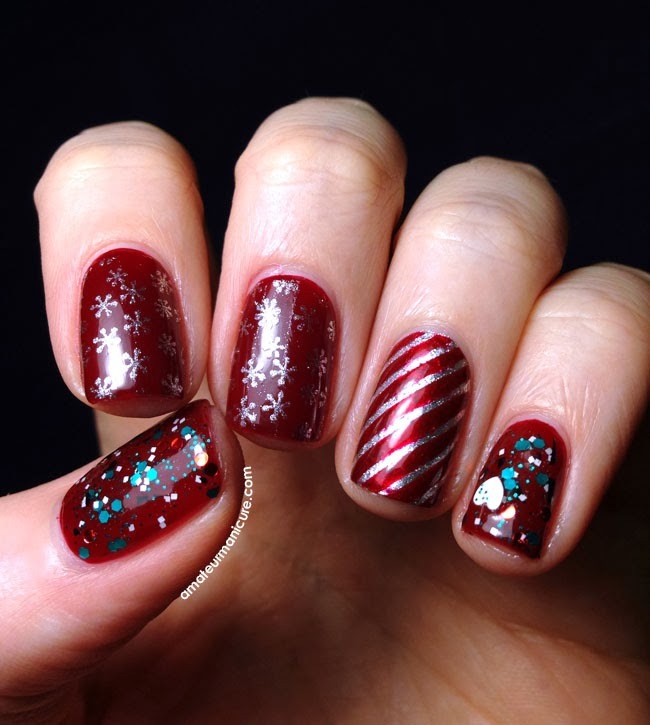 I've been wearing this manicure for a few days now, and I can't decide what it reminds me of more: mint candies & other delicious holiday goodies, or an over-the-top holiday sweater. 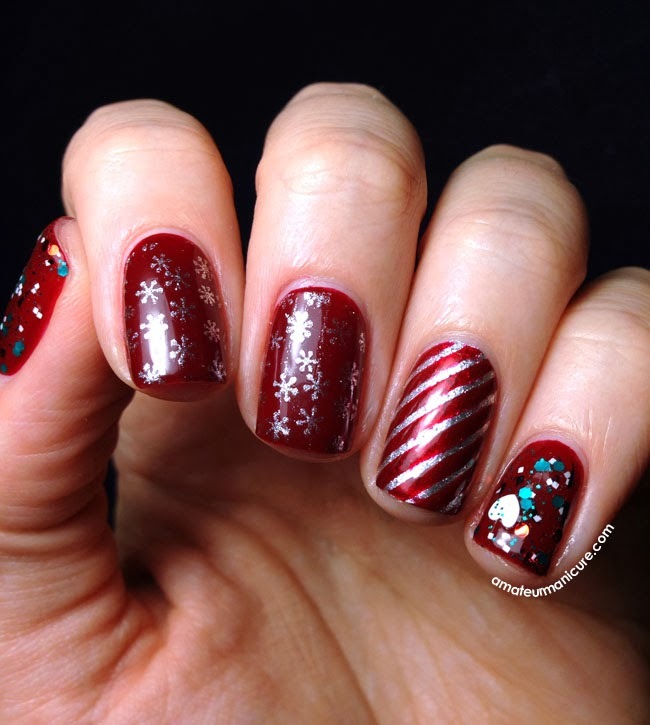 Either way, I think this is definitely a Christmasy look through and through! I started with a base of tenoverten Carmine on all my nails (except the ring finger—that got a base coat of Zoya Trixie). 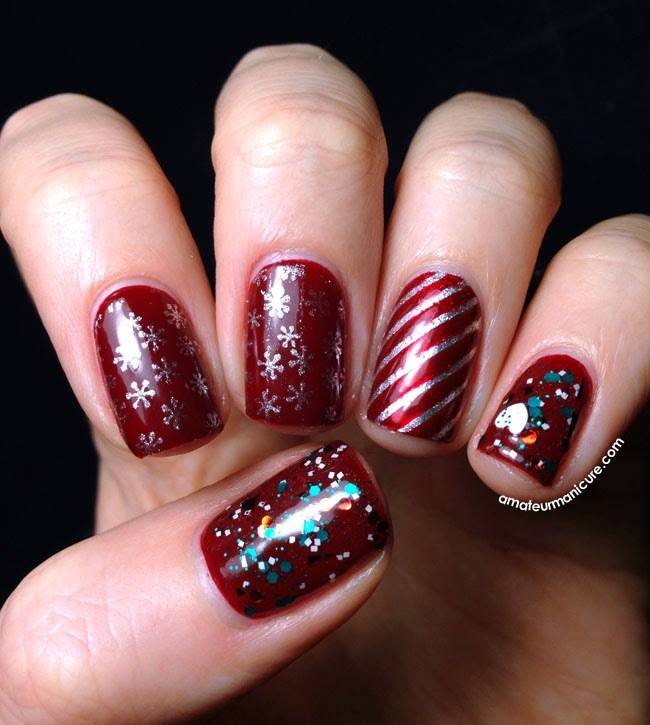 Then I stamped the snowflake-y pattern from MoYou's Artist Collection Plate 04 on my index and middle finger with Trixie, and used striping tape and Carmine to do the stripes on my ring finger. Finally, I painted/dabbed on a generous coat of ILNP Candy Gram on my thumb and pinky. This manicure marked my first attempts using my new MoYou stamping plates, and I'm really loving them so far! MoYou is the hot new name in nail stamping right now, and I can definitely see why. The plates are very high quality and full of gorgeous images that transfer really well. I'm kind of a terrible stamper—my New Year's resolution is going to be improving my stamping skills, in fact!—but even I had a pleasant experience using these plates. Check them out if you have the chance!